Most of our time throughout the day is spent at work and while many businesses use some type of commercial cleaning service, the actual cleaning performed may be insufficient. Constant foot traffic, large meetings and clients coming in and out of the office can leave dirt, dust, allergens and harmful pathogens in carpets, blinds and deep within the upholstery of office furniture. Interkleen offers comprehensive commercial cleaning services and janitorial services in Palm Beach County. Our team of cleaning professionals will create a cleaning plan that will provide deep cleaning and sanitization of your business, facility or workspace. We will offer cleaning services that fit your budget and schedule, as to not interrupt your business during working hours. At InterKleen, we understand that a professional commercial cleaning service is crucial for maintaining a clean workspace in order to create a nurturing environment that increases productivity and reduces the likelihood of spreading illnesses such as the cold and flu. Many businesses struggle when an employee becomes sick and the bacteria quickly spread throughout the office from employee to employee. With entire teams out of the office, productivity quickly slows down. Reducing the spread of diseases, especially during flu season, is very important to any business owner in order to keep employees healthy and keep the business flowing. Even when employees are advised to stay home, the damage is already done since the bacteria or virus is already on various surfaces that they touched before they started feeling sick. A deep, professional office cleaning from a company like InterKleen can help ward off germs and reduce the number of sick days taken. Our commercial cleaning service will disinfect all shared areas including bathrooms, breakrooms, and meeting rooms, as well as desktops, doorknobs, faucets, and phones. Employee health and safety is of the utmost importance. When a workplace is fresh, clean and free of accumulated dust and dirt, employees are happier and healthier. The indoor air quality is high and it’s easier to breathe. A work environment with polluted air contaminated with particulate matter that is being recirculated by the AC unit does not foster a happy and healthy workspace. The air ducts in an office must be regularly cleaned to keep free of harmful pathogens like allergens, bacteria, and mold. Frequent carpet and upholstery cleaning to fully remove dust and allergens also goes a long way when keeping workplaces clean. That is why a regularly performed, deep professional cleaning leaves your office air clean and fresh. A clean, organized and sanitary office with air that smells fresh will have a large impact on customers, clients, and visitors. 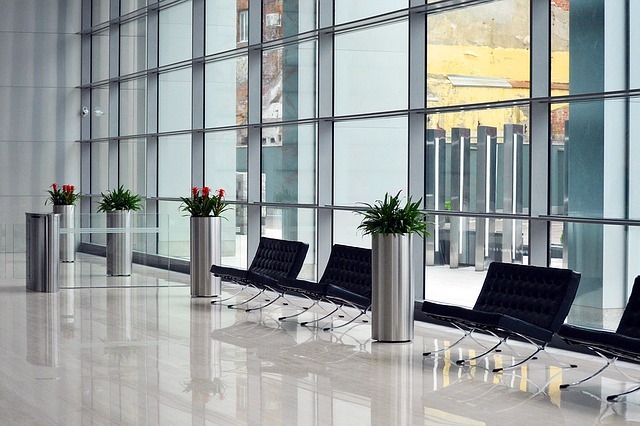 In order to maintain a professional appearance and inviting atmosphere, all common areas like the kitchen, coffee area, lobby, meeting rooms, and bathrooms must be cleaned and sanitized thoroughly every day. The commercial cleaning and janitorial services provided by InterKleen will ensure that your workplace is clean and in top shape. Call us today at 561-732-1818 regarding commercial cleaning services for your office, business, or facility.